The Pack 'n Play Element playard puts all the essentials into a go-anywhere, do-anything package, which makes traveling with your little one easier than ever. This sleekly-designed playard has airy mesh sides for maximum ventilation, and a removable, full-sized bassinet to keep your little one cozy. And when you8217;re ready to travel, the signature push-button fold and carrying bag make packing it up a cinch. Features: Sleek frame design with airy mesh on all sides to provide maximum ventilation Removable, full-size bassinet is perfect for napping Quilted mattress pad creates a comfortable nap space Signature Graco174; push-button fold makes closing your playard quick and hassle-free Toy bar features soft toys to amuse your baby Convenient carrying bag for no-fuss travel and storage Electronics module with songs and soothing sounds Changer with cushioned rim for more comfortable diaper changing Three cubbies to keep baby essentials close at hand Specifications: Weight: 28.8 lbs Height: 33.3" Width: 28.5" Depth: 40"
Graco Element Pack'n Play Playard + Bassinet Pippa - New! Free Shipping! Last updated: April 20, 2019 at 11:46 EST. Pricing information is provided by the listed merchants. GoSale.com is not responsible for the accuracy of pricing information, product information or the images provided. Product prices and availability is subject to change. Any price and availability information displayed on amazon.com or other merchants at the time of purchase will apply to the purchase of the product. As always, be sure to visit the merchant's site to review and verify product information, price, and shipping costs. GoSale.com is not responsible for the content and opinions contained in customer submitted reviews. 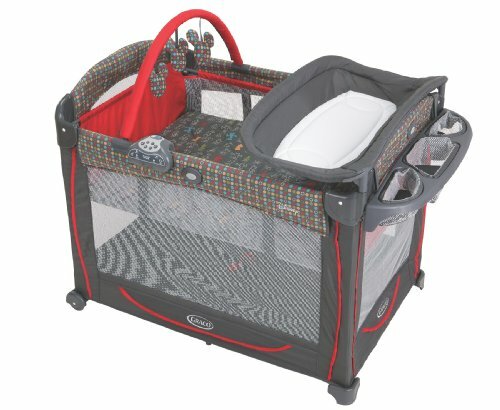 Find similar products to the Graco Element Pack'n Play Playard + Bassinet Pippa - New! Free Shipping!